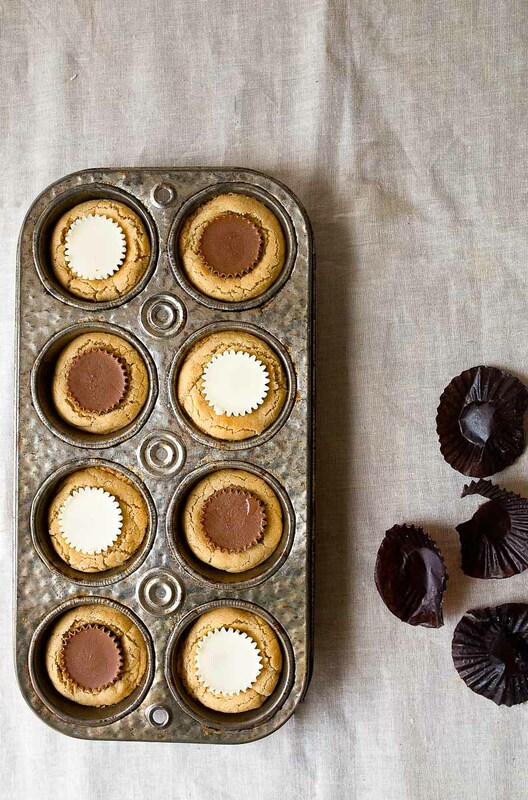 Peanut butter cup cookies made with Reese’s in mini muffin pan. Small batch peanut butter cookie cups, makes 8 cookies. These are the most delicious cookies ever that I totally forgot about for years. Did I ever tell you that I lived with another girl named Cristina in college, and together we were the ‘C(h)ristinas’ and together we threw the best parties ever? I probably shouldn’t go on, for fear of sharing stories about partying so hard that one of us herniated a disc in our neck. And I probably shouldn’t mention that we had a floor-to-ceiling book shelf filled with wine bottles. Or that one of us was called the pretty Cristina and the other one was called Grandma. I never questioned much why I was called Grandma. I figured it was because I drank tea all the time, baked cookies, and went to bed early. One can party, but one cannot party much past midnight. But, I did party better than my narcoleptic friend Haley (true story). The joke is on them, though, because I went to bed early with a plate of these cookies. And if white chocolate Reese’s peanut butter cups existed back then, I probably wouldn’t have had a party. Or, it would have been a party for one on the couch where I angrily kicked everyone out of my house so I could eat these alone in peace. Ok ok, I’m starting to see the Grandma resemblance. For fear of old habits dying hard, I needed to scale down these cookies. This recipe makes just 8 cookies. I hope that doesn’t make you sad. 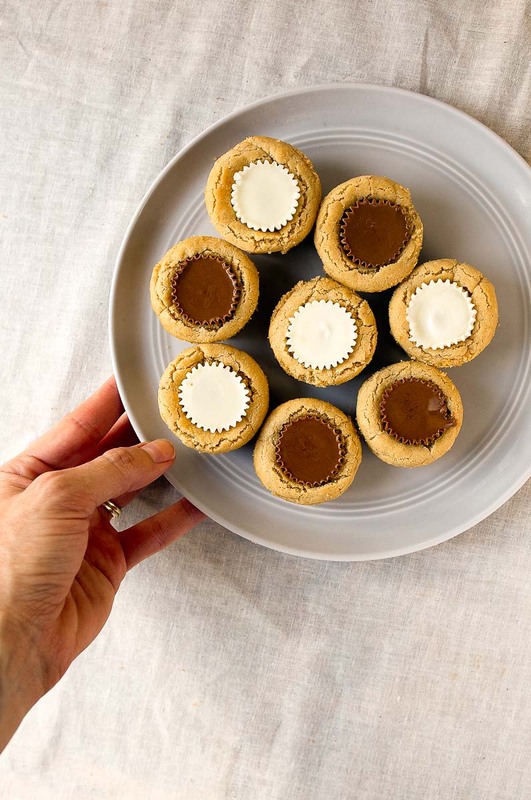 You can certainly scale this peanut butter cup cookies recipe up, but you just have to remember to not eat half the bag of Reese’s in the car on the way home from the store. Small caveat, heh. My vintage mini muffin pan has exactly 8 cups, which is so fun, but here’s a regular one with only 12 cups if you need it! I feel like I apologize a lot this time of the year because everyone is large-batch baking desserts and sweets to share, and I’m just over here with my mini cookie sheet, making 8 cookies at a time. Small batch cookies are my life. But I don’t really know any other way to be than to just be me. I figure you already have your family recipes that you make year after year anyway, so why not make these as a little treat that you don’t have to share? I’m always going to give you reasons to eat dessert for one or two. Deal? A small batch of Reese's peanut butter cup cookies in a muffin pan. Grease 8 mini muffin cups with extra butter. In a small bowl, whisk together the flour, salt, and baking soda. In another small bowl, stir together the very soft butter, sugar, peanut butter, and brown sugar. Stir in the egg yolk, vanilla, and milk. Stir the wet ingredients into the dry until no streaks of flour remain. Press the dough flat in the pan, and divide it in quarters by eye. Make two cookie dough balls from each quarter. 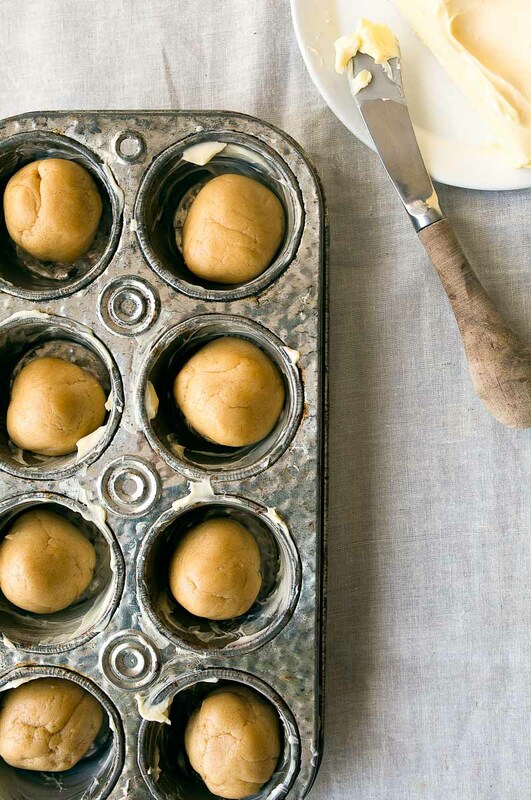 Place the dough balls in the muffin cups, and bake for 9 minutes. Meanwhile, unwrap the peanut butter cups and have them ready on the side. 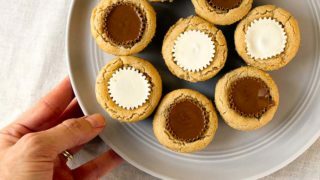 Immediately when the cookies come out of the oven, press a peanut butter cup into the center. Let cool in the pan, and then serve. I feel you! I’d much rather go to bed with a plateful of these than to party late night. Love how simple, but delicious these are! This is an insanely dangerous recipe for me to have on hand, I love these cookies so much! Christina, these cookies will be made (oh my), but I am in love with your muffin pan. It looks vintage, is it? Looks so good! Do you have a recommendation or link for a pan like the one in the picture? Hi Ashley! Thanks! I wish! It’s a vintage pan. 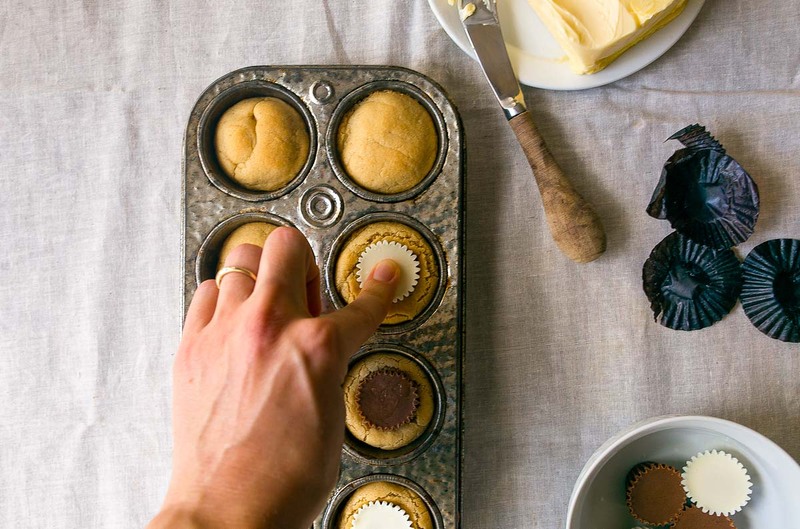 Any mini muffin pan will do, though you’ll only use 8 holes in the pan. HAHA I thought I was the only person in college who people called Grandma :):) I too went to bed early and wasn’t so much of a partier, still not a partier but have turned into a baker as well. Cannot wait to make this cookies, hopefully after voting today!! I could eat this entire plate! Lovely cookies! So creative! Great photos too! Hi,I made these cookies they turned out gr8,I made it second time today n made cut out cookies with same doug,n baked it for 11mins,they turned out gr8 again, thanks for the recipe. I’ve commented on Instagram but not on your actual blog before. These are in my oven right now. Some jerk ate all the PB cups so I’m using Hershey kisses instead. Do you think this recipe would work without the peanut butter cups? So I can just make a small batch of peanut butter cookies?